Looks like the Nintendo 3DS is suffering more issues other than the lackluster launch titles. A small number of gamers who purchased the Nintendo 3DS is suffering from the dreaded, “Black Screen of Death” (see image below). Early reports indicate that simply playing certain games like Ghost Recon: Shadow Wars, Super Monkey Ball 3D and even Street Fighter IV would trigger the error. Some digging from GoNintendo indicates that no one game causes the error. Our recommendations are that if anyone is experiencing any problems with their Nintendo 3DS console, we recommend that in the first instance they download and install the latest system update, now available online. If the problems still persist we recommend they contact their local Nintendo Customer Service centre to investigate the problem. 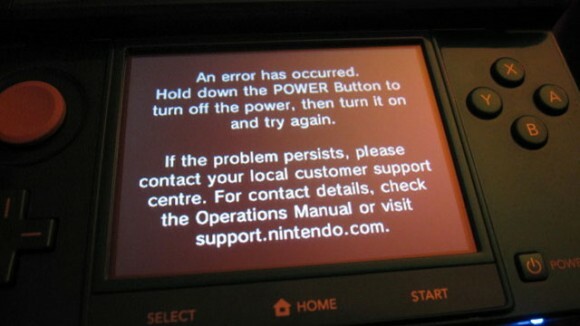 Let’s hope that Nintendo manages to roll out a firmware update to fix this soon. If you encountered this error and managed to fix it, you can help others out by posting your instructions on how to resolve the issue in the comments.